The brand behind this new, beautifully packaged tea has a bold plan to connect consumers with farmers like never before. Charities working in underdeveloped countries have the capacity to do incredible work. From improving food security to increasing access to healthcare and education, the nonprofit sector can make much-needed change. But as Paul Bain and his father Grayson Bain discovered, if the funding dries up, so does the ability to provide aid. Business, the Bains decided, is a better way to foster sustainable change in poverty-stricken communities. And so the Vancouver-based JusTea—a company dedicated to creating and serving a market for high-quality Kenyan tea—was born. Why Kenya? And why tea? Unbeknownst to many Americans, the East African country is actually the largest exporter of tea in the world. While most tea is plucked from small family farms, the lion’s share is sent to large-scale processors that grind the tea for lower-quality tea bags. JusTea not only cultivates a Western market for Kenyan tea, but it also invests in the equipment and education for farmers to process the tea themselves. Here, Paul Bain, "Tea Captain" of JusTea, talks about his company’s commitment to sourcing directly from farmers, tips for doing business in a different country, how a specialty Kenyan tea industry can elevate farmers out of poverty and his audacious plan to innovate in transparency. How long has JusTea been around, and what is your vision for the brand? Paul Bain: We started working with small-scale Kenyan farmers in 2012. Both my dad and I have been involved with charity projects in Eastern Africa. We started to realize that they weren’t sustainable. If donor money wasn’t coming through, people weren’t getting that they needed. 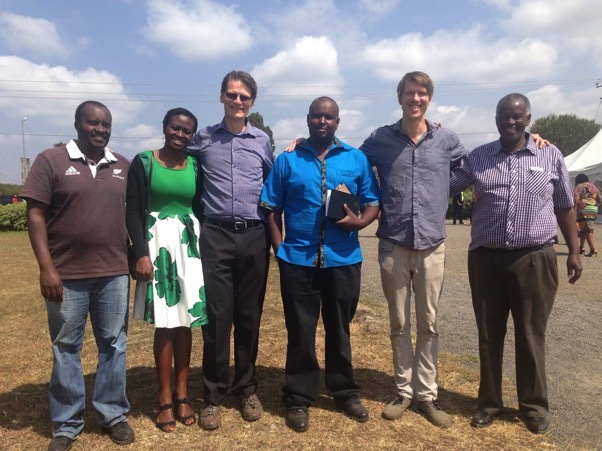 We traveled to Kenya to find business partnerships with small farmers so they didn't have to rely on NGOs. There, we connected with a tea farmer and spent a few days with him and his family. We were touched by his story. His tea garden had been in his family since 1903. Two things he said stayed with us: One, he couldn’t earn a living from tea. Two, he had no idea what his tea tasted like—when he dropped his tea off at the factory, it just got mixed with other batches. My dad and I started to think how we could work with farmers. We thought farmer-direct tea that farmers can pluck and process right on their gardens was the answer. We could market these teas as fair trade and fully transparent because we know their story, and the supply chain is shortened. Winter Fancy Food Show was the launch of our new tea packages. We’re very new to the United States market. Could you describe some of the challenges about working in Kenya? PB: The majority of Kenya’s tea is exported as a simple commodity. It is ground-up tea you’ll find in your grandma’s pantry—called the cut-tear-curl method, or CTC. It is definitely not traced back to the farmer, and it has a narrow flavor profile due to the way it is processed. So you could say that JusTea launched the specialty tea market in Kenya? PB: When we first started working in Kenya, we were nervous the government would shut us down because we didn’t want to work with the massive tea factories. It was a collaborative effort between us and our farmers to obtain a cottage tea license—we both put pressure on the Kenyan government, which was on board. Kenya-branded tea benefits both the farmers and the country because it creates a market. Talk about lasting change through business. PB: It’s still very early, but we're very excited to be producing full-leaf tea. We’re trying to shake things up. Can you talk about purple tea? I understand this is a relatively new item from Kenya that shows a lot of promise as a marketplace differentiator. PB: Yes! Purple tea is a cultivar that has been researched by the Tea Research Institute of Kenya for the past 30 years. In 2011, they first released it to farmers to plant, and it’s just now coming to harvest. The purple color comes from anthocyanins—super antioxidants found in other purple plants like blueberries. It’s the only tea that has them, and it’s only grown in Kenya. We’re hoping that purple tea becomes a new category to help place Kenya on the gourmet tea map, much like Assam tea did for the Assam region of India. You’re hoping to eventually have a system in place where consumers can text farmers directly? Why is this degree of transparency important? PB: Tea companies are starting to share the estate from which they get their tea. But Kenya is unique because 60 percent of tea grown in Kenya is by small farmers who have one to five acres of land. Interestingly, most everyone in Kenya is on social media through their cell phone. Our farmers are active on WhatsApp and Twitter, and they are excited to hear what tea drinkers think about their product. We’re talking with our farmers constantly. Right now, through the hashtag #JusTea, our farmers are able to write to consumers with questions. As we move forward, we want to grow those conversations through tea drinkers and tea farmers by offering tea safaris. But for now, we’re doing this through technology. It’s still a work in progress—we might end up having specific Twitter handles for different groups of farmers so shoppers can tweet questions directly to them. JusTea is committed to sourcing farm direct. But is this model scalable? PB: The main idea behind farm direct is we want to make sure we know where our farmers are coming from. To do this, we have trusted leaders on the ground in Kenya who are always looking for new farmer partners—and providing us updates. This was one of the things we learned fast. As Canadians, we don’t know the culture of business in Kenya. Whether with our tea farmers or co-op herbal farmers or carvers [for the wooden spoons on our packages], our leaders in Kenya gain legitimacy in the community, and inspire confidence in us.